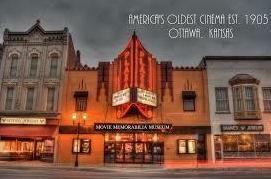 HISTORIC PLAZA CINEMA and MEMORABILIA MUSEUM TOURS - Rare opportunity to own the fully operational business and historic landmark on Main Street in downtown Ottawa, KS. This unique property has been featured nationally in magazines, newspapers and books. It's officially the oldest, purposely built movie house in the world! Guinness World Records just recently certified it! Built in 1886, the character and exterior facade have been notably maintained and preserved over the years. Visit Plaza1907.com to preview. 209 S Main Street (MLS #2121295) is a commercial listing located in Ottawa, KS. This property was listed on 07/30/2018 and has been priced for sale at $875,000. Nearby zip codes are 66086.